Unlike its prequel, What Sunny Saw in the Flames, with its heretical use of language, idiosyncratic description of African mythology and blinding characterisation, Nnedi Okorafor’s Sunny and the Mysteries of Osisi with every page excited and intrigued this reader. Set in contemporary Africa, the new book continues the story of the Leopard Folk – people with surreal abilities – through the hazel eyes of the heroine, Sunny. While the author employs a third-person point of view in presenting the heroine, the other characters are only seen through Sunny’s eyes. In more ways than one, this can be viewed as an allusion to the relationship between her albinism and the meaning of her spirit name, Anyanwu, eye of the sun. The story takes place two years after the events of What Sunny Saw in the Flames and, as with the former, we can draw comparisons to J K Rowling’s Harry Potter series. The most striking parallel is the role arachnids play, namely Aragog and his descendants, in Rowling’s Chamber of Secrets, in helping the young wizards uncover the mystery of the basilisk and, thus, Voldemort. Udide, a knowledgeable, ageless deity helps the Oha Coven, a group of young witches – Sunny, Chichi, Orlu and Sasha – uncover the mysteries of Osisi and in their showdown with the deified antagonist, Ekwensu. Sunny, who has slowly begun to come to terms with her abilities is, once again, drawn towards danger as she faces off against a large octopus and is saved by the finned water deity, Mami Wata. It transpires that Sunny and the aged Anyanwu will have to face separate obstacles even though they are the same person. A murderous djinni who knows Anyanwu, is used as a pawn to help Ekwensu break the bond between the albino and the sun. Death himself, whose ‘blaring whiteness’ stands behind Sunny throughout, and a grasscutter whose taste in music runs to the rambunctiousness of Afrocentric hip-hop, bring many lessons for the Oha Coven. As the tale unfolds, the literal meaning of What Sunny Saw in the Flames becomes evident. Sunny and the Mysteries of Osisi examines numerous symbols and themes that are relevant to the difficulties and realities of the modern African world, while simultaneously holding on to the antiquity that lends magic to the tale. However, there are problems that arise for the author due to the dual nature of her commitments, problems that go without elegant solutions. While it can be said that every book has sections, chapters, characters or symbols that critique or satirise society, it is rare for successful young adult fiction to touch on so many contemporary topics at once. The copious symbols and allusions in the book involve so much diversity yet the in-depth analysis of socio-political and economic conditions from which successful Afrocentric books derive their density is lacking. Again, there is Sunny with her allergy to juju powder, which can be seen as a conflict in the confluence of her African and American heritage, the pale whiteness of her skin and the probity of her black magic. There is also the recurring imagery of red jollof rice, goat meat and pepper soup, which calls undue attention the contrast between the Americanness of Okorafor’s writing and the Afrocentric nature of her mythology. One of the most significant aspects of Okorafor’s book is the discussion of the superstitious beliefs of West Africa. As stated in one of the books within the book, Nsibidi: The Magical Language of the Spirits, ‘Superstitions are like stereotypes in a lot of ways. Not only are they are they based on fear and ignorance, they are also blended with fact’. Through Orlu’s aunt, Uju, the author examines the prejudices and biases of some excessively religious people, notably their attitude towards albinism, which like many other unique conditions they stigmatise as an affliction or a curse. Okorafor also uses an incident with Uju to hint at the ogbanje superstition of the despairing child. Another example of the symbolism of superstition is seen through the Ujo spell that Anatov, one of the children’s mentors, teaches the young Oha Coven. The spell imposes unimaginable fear upon the Lambs – non-magical humans – and prevents them from exploring certain places where they can view magic. In other words, fear as a major human emotion, an innate response to things that human beings do not understand. A surprising aspect of Okorafor’s book is its unconventional syncretism. To be sure, in West Africa Christianity and Islam have mixed with older indigenous practices, yet the thought of juju or magic or deities existing as subordinates or deputies to Yahweh or Allah is blasphemous. Yet Okorafor subtly weaves a rich tapestry of polytheism where Islam, Christianity and traditional beliefs are united as one. On p 59, Ali, one of the Elders of the Leopard Folk who, in the previous book, was endowed with the ability to transform into a toucan, says, ‘Inshallah’, when he leaves Sugar Cream’s office. Also, in the fourteenth chapter, Sunny, after surviving her ordeal with the djinni in the basement, views Sugar Cream as ‘shining like Jesus Christ’. For Okorafor, all the deities are simply creations of Chukwu, the Supreme Being and the ‘Unapproachable Supreme Creator of All Things’ (p 300). Another recurring symbol in the book is water and its portrayal as being synonymous with life: in the first chapter, Sunny is attacked by the lake beast and rescued by Mami Wata; the river and lake beasts are infatuated with Sunny and Anyanwu, and the humidity of the long-breasted seer’s house makes the pores of the pair seep with fluid; the ceremonial mask on the walls of Ekwensu’s house is made of water; the non-euphoric drowning feeling that Sunny experiences whenever she crosses between worlds – these are all reminders that all of life depends on water. Perhaps one of the most poignant points that Okorafor makes in her book is the normalcy of patriarchy in African culture. Sunny is often seen as weaker and less important by her father, a point which Okorafor makes consistently to show that, in Africa, sons are considered more valuable than daughters. ‘Sons, sons, sons, even when you had two. And if not a son, then a beautiful, polite, docile daughter’ (p 123). Unlike Chimamanda Ngozi Adichie, who is fierce, outspoken and, sometimes, point-blank brash, Okorafor expresses her views more subtly but it is nonetheless crystal clear where she stands by her use of hints, quotes and the snide remarks that she places in the mouths of her characters. 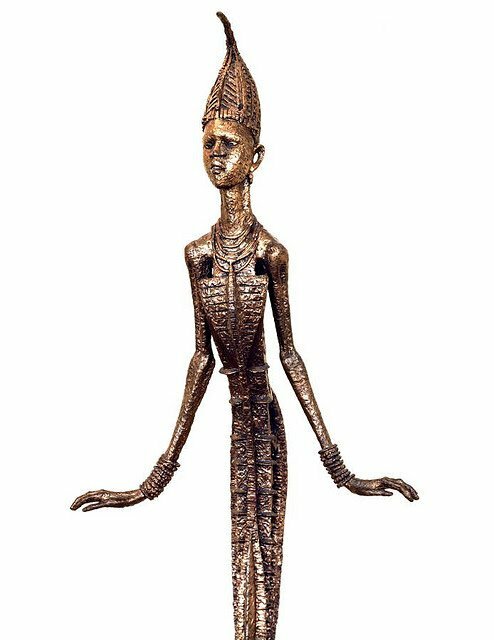 From the prequel and continuing in Sunny and the Mysteries of Osisi, Okorafor takes a position against the belief in the superiority of men by characterising her antagonist, Ekwensu, as female, rather than the male deity with which that name is usually associated. Furthermore, some of the most powerful characters in the book – Sugar Cream, Sunny’s shape-shifting mentor; Ozoemena, Sunny’s maternal grandmother with skin as dark as tar; Udide, the great arachnid deity – help form the image of female empowerment. In the end, Okorafor reveals the Supreme Being, Chukwu, to be neither male nor female – the point seems to be that fairness and justice are more important than one’s chromosomes. Sunny is a constant reminder that – through her being African even though her skin rivals the sun – blackness no dey show for face. This symbolises the openness that all people, black people especially, should show to one another. Okorafor also explores fear as a hindrance to confidence. Unlike in the first book where Sunny discovered that the wooden-faced Anyanwu was another part of her and that together they made two parts of a whole, Sunny and the Mysteries of Osisi introduces the concept of doubling: an affliction, usually fatal, where one’s spirit face is torn away from their physical self. Sunny and Anyanwu are torn apart and their bond severed by Ekwensu. Sunny, who believes that she is nothing, non-magical and powerless without her ancient twin must then learn the lesson which most humans are yet to learn: as much as fear is one of our innate responses, serving to promote survival, it destroys our confidence, thrusts us into despair and blinds us to the power, the possibility and the reality of survival through other means. Through Sunny and Anyanwu’s ordeal, Okorafor examines the difficulty of having to hide one’s true self away because of the fear of non-acceptance or stigmatisation; she examines how one must overcome the debilitating effects of fear and use it to one’s advantage. She allows that fear does not destroy one’s true self, it only hides it in the crevices of the heart where bravery and other emotions must work hand in hand to bring it to the surface. While it is undeniable that Okorafor is quite adept at weaving fantasy tales, it must also be accepted that her works call for patience and understanding from readers who are used to the glamour and glory of mythological books but alien to the remarkable uniqueness, picturesque deviation and enchanting peculiarity of the afrocentrism in juju powder and jollof rice.